When I came home from work the other day, what did I find by my mailbox but a box....boy was I surprised. It was from a friend of mine who had just been in town the prior weekend from Jacksonville, FL. Years ago when I was working as an International Courier (think spy but without the spy business) I got "hooked" on a few European products. You damn Europeans! We had been talking about the past (don't we always) and we were talking about these products, he had said that he had found a place to buy the oil and was still enjoying it....I was jealous! 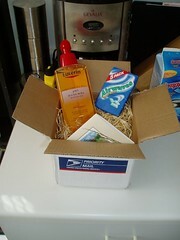 The firstthing in the box was Shower Oil or Duschol. Originally my friend found this in Sweeden and whenever I had a stop over in that lovely airport (it is a beautiful airport) I would always buy a bottle or two of this stuff. The only way to explain it is, it's soap and baby oil all in one. So you get your moisturizer AND your cleanliness all in one. Since I haven't been doing the courier thing in years, I only had one bottle left and I'd been hoarding it, I only use on special occasions since it's such a rare commodity now. He told me the only place he could find this now was in Germany. So any of you German residents out there, do you use this product? The other special surprise in the box was Airwaves gum from The UK. The only way to explain this is: Vicks Vapo Rub - in gum form. I know it sounds nasty but oh does it "open up your sinus passages" when you chew down on a chiclet of this stuff. It's great in the winter when you're outside, it makes your whole head swoon from the intense cold and the menthol....yum yum yum. Ah presents from across the Sea that came from Florida....aren't they lovely? I'm pretty sure we can get the Eucerin in Switzerland, too. Otherwise, we just hop over the border. I'll have to try that make. As for the gum, they're in all stores here, and you're right, the effect of teh Airwave is really great! I'm not sure if your aware, but I'm british. I travel to England about once a year. I'll be sure to give you a shout when I'm about to travel to see what I can pick up for ya. CS - If you usually put on lotion or baby oil after you shower, you'll love this because it gets rid of a step. Ditsy - I couldn't quite figure out because your blog is UK but I thought you were here in the States....Let me know when you're traveling again, I can always chew gum! I've never tried the Eucerin Shower Gel but it sounds like a good tip for the winter months when my skin gets really dry. Karen - Check it out, you'll love it. As for the Airwaves, it's made by Wrigley, which has their headquarters less than 10 miles from me. I've called them and gone to their "company" store and they don't/won't sell it in the US. Bah! Yup - I was born and lived in the UK most of my life. Then I met an amazing American boy who captured my heart and we got married and I came to live in Il about 3-4 years ago. I keep the .co.uk domain because its been .co.uk for about 6 years ... but I have a bunch of .com's pointing to the same place (ditsybint.com, ditsy-bint.com etc). But anyway ... *yawn* .... Next time I travel I'll give ya a yell and take a small shopping list for ya. I still love you though! It's starting to get 'spensive around here! WARNING - Please Read This! I can't believe I didn't post this!